I’ll admit right off the bat – there’s nothing groundbreaking about this recipe. 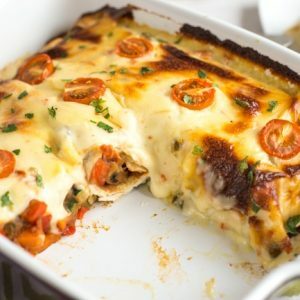 These refried bean enchiladas are super simple, stuffed with veggies and beans, and topped with a spicy jalapeño cheese sauce. 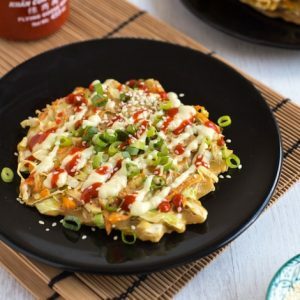 All pretty straightforward – they’re not anything particularly novel, they don’t use any trendy ingredients, and they’re not prepared in an unusual way. 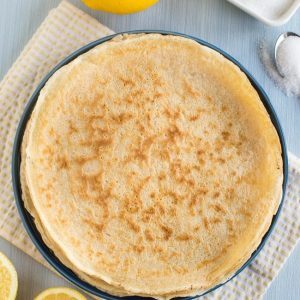 But what they are is absolutely flipping delicious – so I wanted to share the recipe anyway. And when I say these bean enchiladas are flipping delicious, I mean they’re flipping delicious. In fact, I hope you appreciate how hard it was to take these photos. When there’s a big, bubbling pan of cheesy sauce in front of me, the last thing I want to do is not eat it. If you look closely at any photo I’ve ever taken of a casserole-type dish, you’ll usually spot an area where I had a cheeky nibble at the crispy bits (top left of the pan in the above photo). I’m sorry, I’m weak. 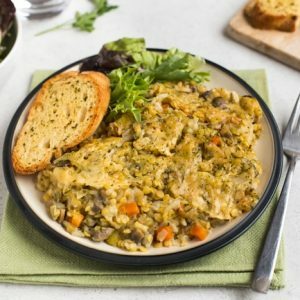 Since this recipe is super adaptable, I took the opportunity to clear out my fridge, and just added whatever veggies I could lay my hands on. In the end I used courgette (zucchini), mushrooms, pepper and carrot. Feel free to use whatever you have handy though! Along with some spices and a good dollop of my favourite refried beans on the planet*, it makes for a quick and easy enchilada filling. 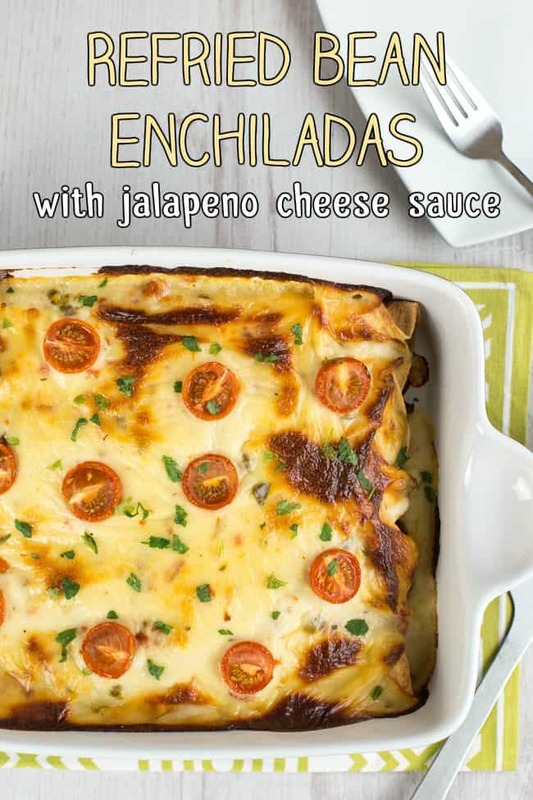 To be honest, the star of these refried bean enchiladas is the spicy jalapeño cheese sauce. I know I said that I’m trying to not add too much gratuitous cheese to my cooking these days, but believe me, this cheese sauce is far from gratuitous. 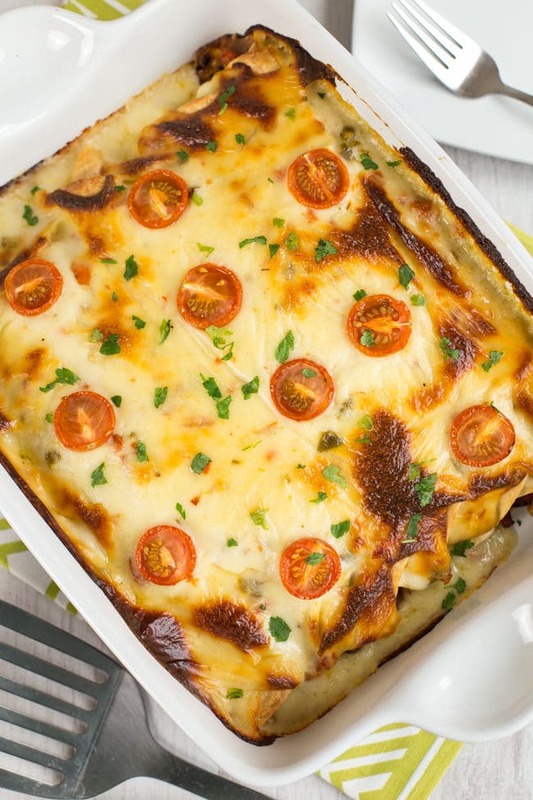 The jalapeños really take a standard cheese sauce to the next level – the spice cuts right through the richness. 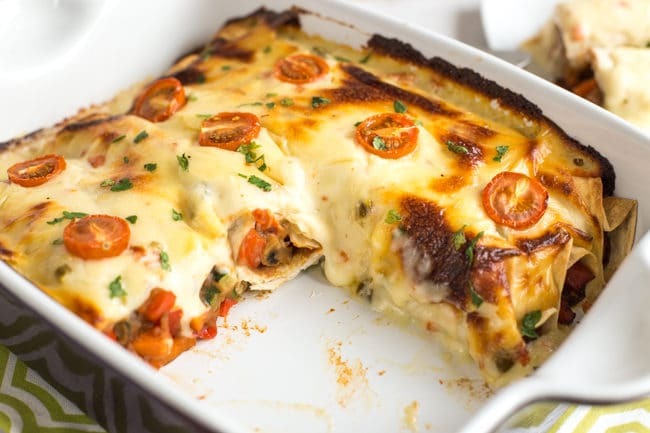 I did manage to resist adding any extra cheese on top of my enchiladas – they really don’t need it, and I like the way the creamy sauce crisps up on top anyway. I added a few halved cherry tomatoes instead, just to make my enchiladas look a bit more interesting (slices of a bigger tomato would work well too – I was still on a fridge clearing mission!). Heat the oil in a large frying pan, and add the diced vegetables. Cook over a medium heat for at least 5 minutes, stirring regularly, until the veggies are soft. Add the smoked paprika, chilli powder and cumin, and mix to combine. Spread a generous dollop of refried beans along the centre of a large tortilla, and add about 1/6 of the vegetable mixture. Roll tightly, and place seam-side down in a large baking dish. Repeat with the remaining tortillas, beans and vegetables. To make the jalapeño cheese sauce, melt the butter in a small pan, over a fairly low heat. Add the flour, and whisk together to form a paste. Cook for a minute or two, then add the milk a dash at a time, stirring until smooth each time before adding more. When you've added all the milk and the sauce is smooth, add the grated cheese and chopped jalapeños. Mix well until the cheese has melted. Season generously with salt and pepper, and adjust the consistency of the sauce with a dash more milk if required. 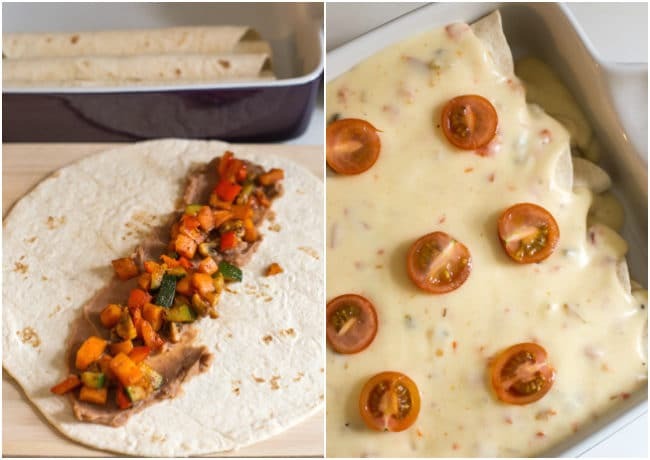 Pour the jalapeño cheese sauce over the rolled tortillas, and top with halved cherry tomatoes or slices of tomato. Bake at 190°C (Gas Mark 5 / 375°F) for around 30 minutes, or until cooked to your liking. Serve with chopped coriander (cilantro) if desired. Got some jalapeños left over? 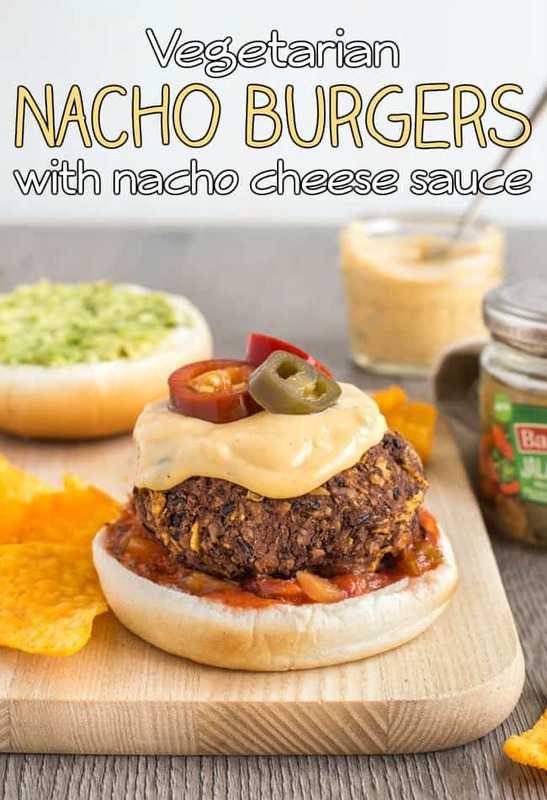 Try making my vegetarian nacho burgers with nacho cheese sauce! * This post contains affiliate links. If you purchase an item using these links, I will receive a tiny (tiny!) sum of money, at no extra cost to you. Thanks for the support! « Previous PostHow is olive oil made? This is the second recipe of yours that I’ve made and it’s just as amazing, if not more so, than the first. This will definitely be made regularly. I used wholemeal tortillas so I could feel slightly less guilty about all the cheese! I couldn’t resist! 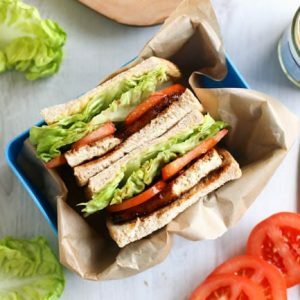 I shared this for Meat Free Mondays. The roundup is now live. I hope that is ok! 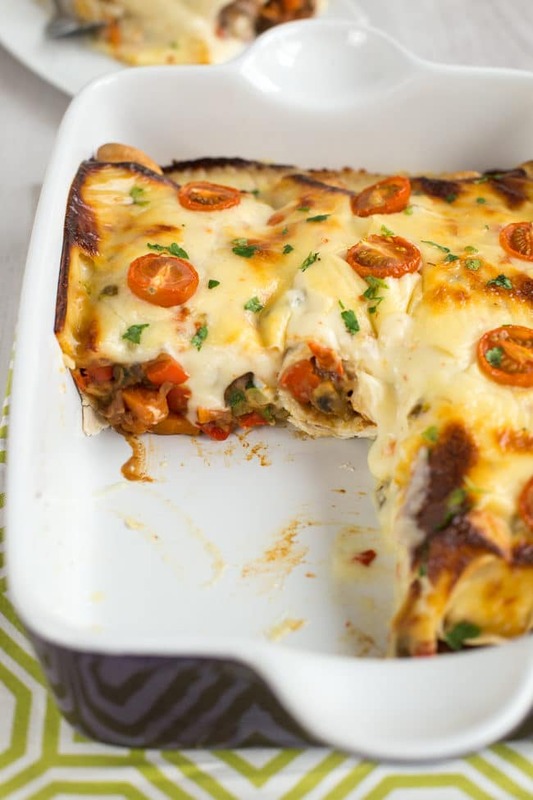 Gorgeous dish! That cheesy sauce looks so good! I can imagine it was hard to dig in while taking those photos! I can totally see why you’re enamoured of this dish. I would be too. The cheese sauce with jalapeños sounds amazing. 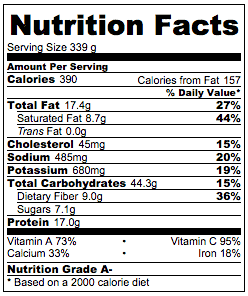 And who needs novel ingredients anyway? I bet it was hard to wait to dig into that! It was a pretty masterpiece though! That cheese sauce looks amazing! these look so good, I want to eat them right now. You have inspired me to make more Mexican food, thanks! These look sooo good! YUM!! 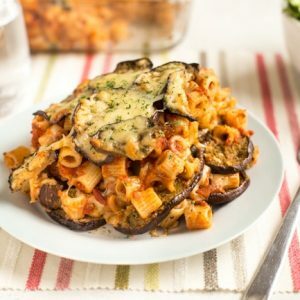 With lent coming up I have to put this in my recipe box! I love all the flavor you packed into this refried bean enchiladas. We’re a huge fan of Mexican food in this house and have it at least once a week. These will be perfect for #MeatlessMonday! Is there anything better on the planet than a good enchilada? I love the addition of the jalapeno to the cheese sauce. Perfect! This looks so good! 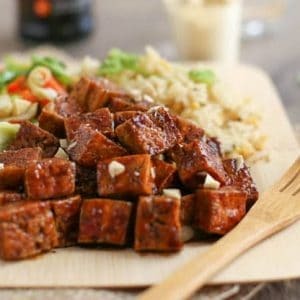 Perfect for meatless nights. This looks so delicious! I feel like this is a meal no one could turn down. Thanks for sharing! What a great recipe! The photos looks awesome. This would be a total crowd pleaser! Yes…. that jalapeño cheese looks SO good. I wish I had a plate of this right now (note to self: do not read blog posts before breakfast!). This looks way more tasty than other bean enchiladas! Thank you for the recipe. 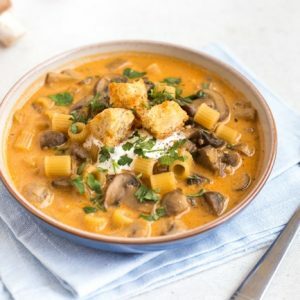 Sometimes the less ground breaking recipes are better, we love recipes like this in our household! This looks amazing. Looking forward to making it. I knew I’d find a use for that can of pickled jalapenos! Thank you.